The Great White North takes the spotlight as the second half of the 2011 harness season presents big bucks in Canada, with the $1-million Metro Pace Final for frosh colts at the center of the program. Frosh fillies go for $633,000 in the She’s A Great Lady Final, with consolations for both events at $100,000 each. 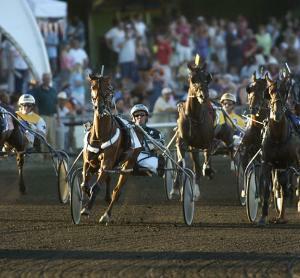 As well, some of the top older pacing males battle once more, this time in the $832,000 Canadian Pacing Derby. A pair of $120,000-plus Simcoe Stakes for glamour-boy trotters is also incorporated in the rich program. TwinSpires bettors will be getting 10X points on all wagers made at Mohawk on Sept. 3, so make your own millions and score valuable points too. The weekend begins with the Historic Series, moved to Vernon Downs from its long-time home at the Meadowlands in the pre-Gov.-Christie era. We start the long, holiday weekend there, Friday, Sept. 2. A staple of the Grand Circuit, the Historic Series is for freshmen. 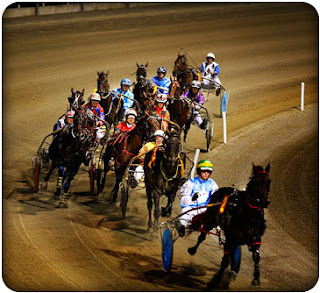 The card is supplemented with two trotting stakes for aged horses and mares, making for a bigger-than-usual night at Vernon Downs. The new faces are becoming a bit familiar. Freshmen are deep into stakes as summer disappears. In the $79,900 Harriman Cup, for instance, our friend Big Chocolate makes another go at getting the first prize at a stake. We like him again and again, in this big field, it looks as if he won’t draw favorite status. In the filly-pacing Goshen Cup ($79,900) we have our eyes on Coast To Coast. This gal has been knocking on the door and cashing some big checks racing with better than these. Linda Toscano’s student looks good in the $61,300 Ladyship for frosh-filly pacers. JK Fine Art could be bet heavily but might also have a co-favorite in this compact field of seven, making her a good bet. There are two $36,000-plus Acorn divisions for frosh-filly trotters, both looking easy if the gals stay flat. However, they could both be better passed considering the ease of Upside Hanover in the first and Shes All In in the second. The older performers’ events may shed some overlay magic. Jersey As was getting better with every race and shows up here in a good spot to upset in the Muscle Hill. If lots of money goes elsewhere, and it should, she can be the surprise here. As will Take My Picture in the Credit Winner. One of last year’s hot Hambo contenders, this guy came back strong at four and may be in a spot to derail the great San Pail, along with Lucky Jim and the others. The Canuck bucks flow like wine on the first weekend of September at Mohawk, with freshmen in the center ring. The $1-million Metro Pace Final doesn’t always produce a soph-colt champ but frosh-pacing talent that is unequaled to that point in any season supports every field in its history. This year is no exception. Barring injuries, it is no stretch to imagine every one of these colts will be talked about for a few seasons. So here we have a highly competitive field. Three representatives of sire Rocknroll Hanover are within winning range. D Terminata is improving (we had him twice to win so far and he won both); A Rocknroll Dance got a smooth trip at 20-1 to win an elim and it was not a lucky ride; and Simply Business got to the final by grinding his way through a long journey. The pair of Western Hanover colts, I Fought Dalaw and Ideal Champ, has earned berths here with classy wins. Speed Again, the only product of Dragon Again) shoots stretch fire to threaten all speed involved. The others, Allstar Legend, Hurrikane Kingcole, State Treasurer and Major Bombay, will be hurling themselves into the action one quarter or another. The most likely overlay could be Simply Business, coming from post 9. Jimmy Takter’s pacer is out of the productive mare Cathedra Dot Com, arguably the classiest of all the moms in this field. But if bloodlines do not impress you then just look at the work he did with driver Ron Pierce to get to the final. The post may help the odds and not hinder the trip. The Metro Consolation should belong to Special Blend, the colt that should have been among the best in the final. The frosh-pacing fillies in the She’s A Great Lady Final should be a showcase for Pirouette Hanover. She may be the choice from post 10, where she won already (Meadowlands) and with pace to spare. It is hard not to key her, as Ron Pierce should be on her again from post 10; he may sweep the two frosh affairs. The Canadian Pacing Derby is an expensive mile, so expect these stalwarts to dig in deeply for some of the thick bills lining the purse. We nabbed Foiled Again last week in an elim but we have a strong upset possibility to support here with Art Professor. He may be stalking these older fellows with a strategic plan to pounce and can do it. He is intrinsically better than We Will See, who he beat when younger, and gets into this field off of a race that deserves attention. In the Spring Of Hope Invitational we will stick with Anndrovette, who had a lot of trouble last week after a race that should have propelled her to an easy win. Toss out last week’s attempt and she could wire this field at a price. Simcoe Stakes unite some of the Hambo crew and these two miles look to be theaters for familiar names waiting to make a big-money score. Certainly Whiskey Tax, the colt that ruined our Players Pool trifecta in the Hambo (we had the first and third finishers) with a huge longshot place finish, may be ready to score in the $121,644 Simcoe. He won’t go off as long as he did in the Hambo but that is good; some action on him is encouraging. He should still be worth it. Then, Pastor Stephen, who was the early-season Hambo favorite, could swamp this group—the $123,644 Simco—at a price we would never have expected from him.